There are a lot of people, things, documents, task and activities involved when working on a project. All of them are equally important in the preparation and making of such project, regardless of what the project is aimed at or what it is all about. 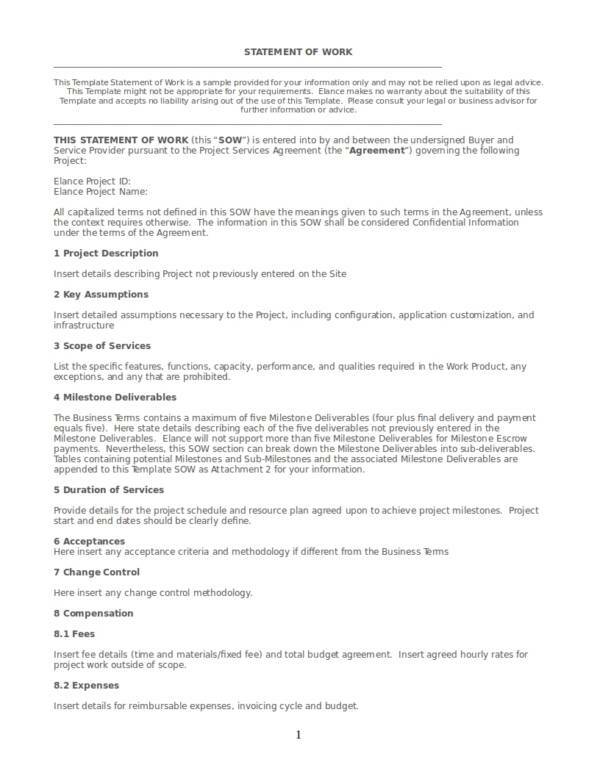 One of the important things or documents that is involved or should be included in a project is a statement of work. 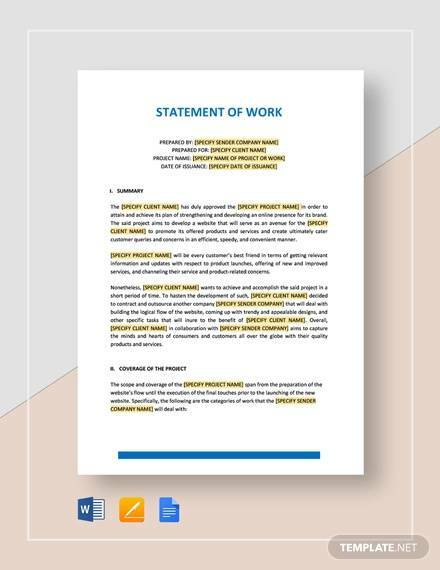 In this article, we learn about statement of work. We will define what it is, what are its uses, its contents or what makes it up, the areas that are addresses by a statement of work and many more. We have also included useful samples and templates that you can use as reference throughout the discussion. You may also download and use them for whatever purpose they may serve you. Check them out below! Before a project is started and all its actions implemented, a plan is first created to ensure that all the efforts put to it will not got to waste. 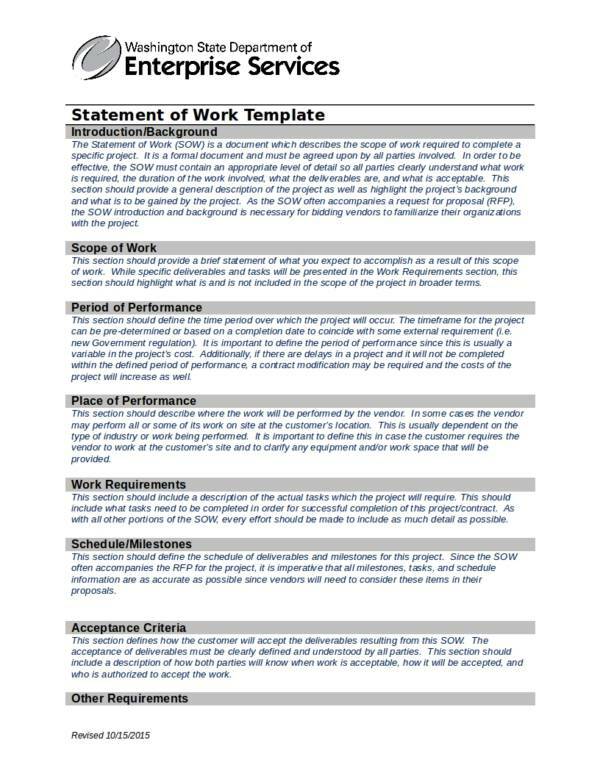 Everything that needs to be given attention to in a project is written in a statement of work. 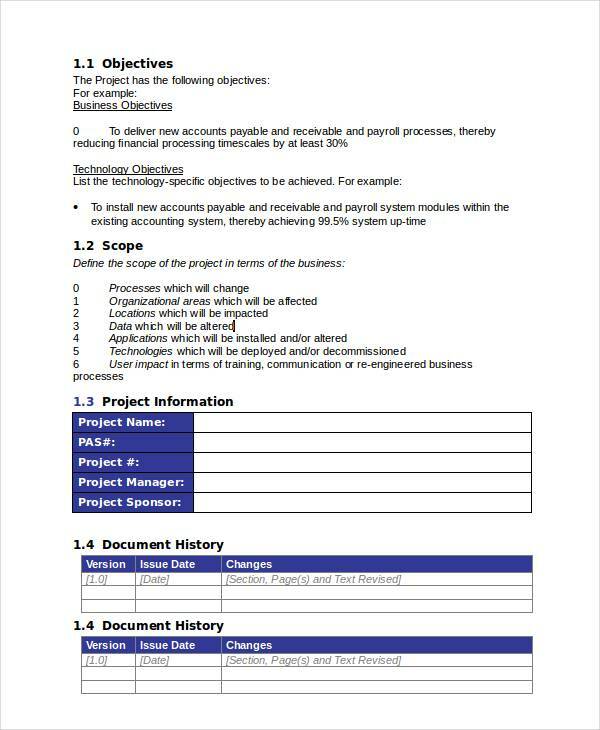 A statement of work is a document that provides all of the important details of the project in all of its different aspects. 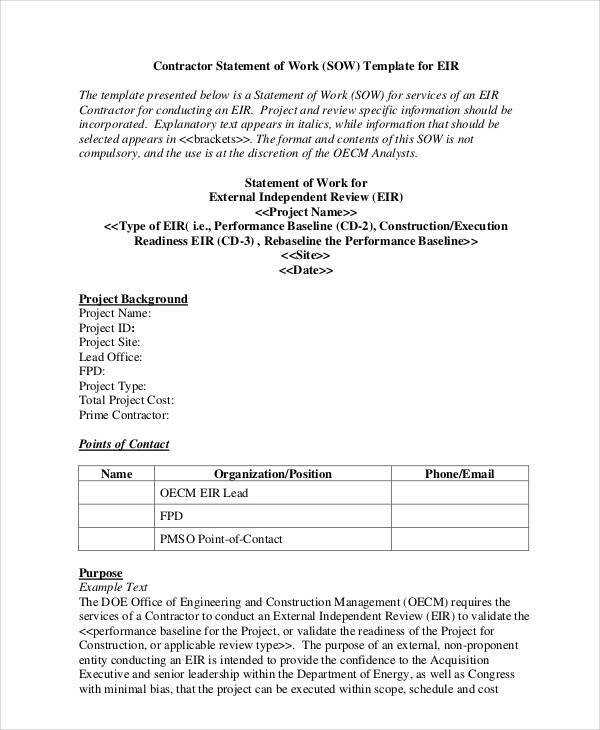 Te document is extremely detailed and thorough as it sets the basis for the groundwork of the project plan. The task of creating or writing a statement of work is one that is considered as a daunting task, owing to its extreme details. 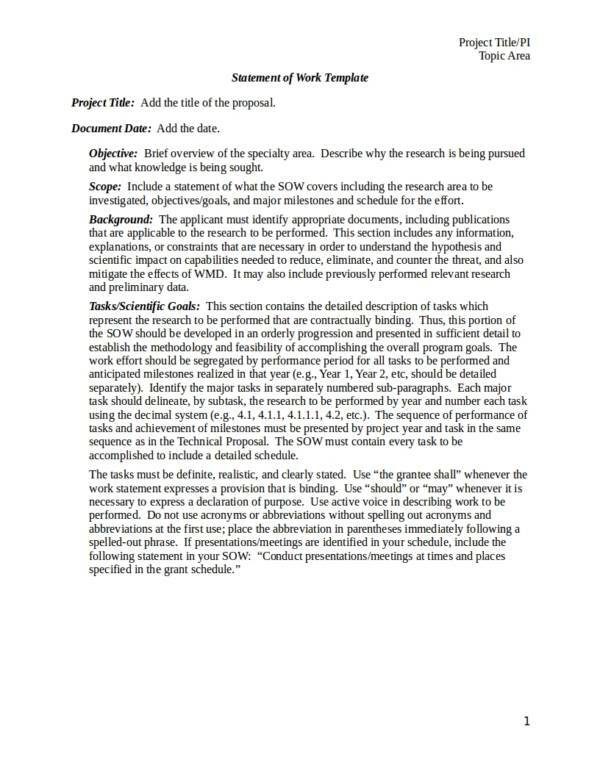 In fact, it is the first document that needs to be created before a project starts its planning an implementation. It needs to be complete and accurate even with tons of details that needs to be included in it. 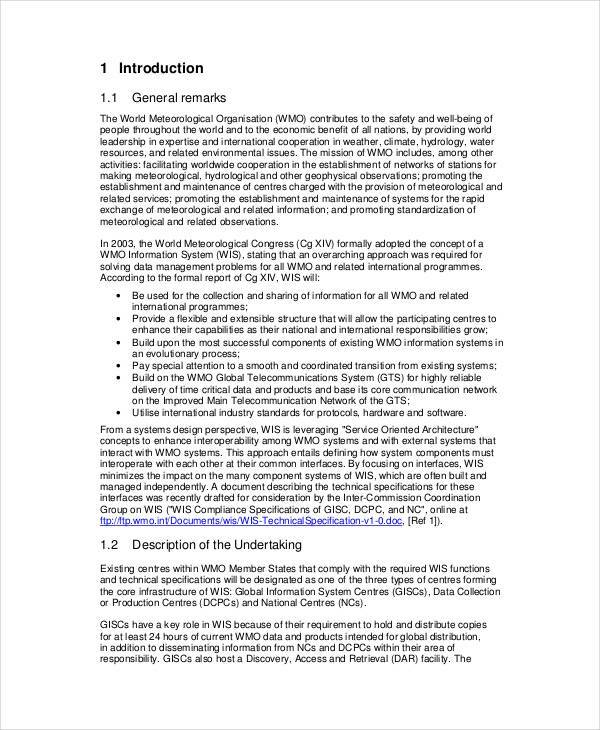 Why is this document so important? Let us check out its uses to find out why. A statement of work provides a detailed overview about everything that is related to the project that is being worked on. And by everything, that means every single detail that is involved in it, big or small. It is used in setting the right expectations with your client as well as all of the people who are involved or who are going to work with you on the project. They could be those you are collaborating with or your contractors. It is best set the right expectations to anyone. A statement of work is one way you can share the details of the project and what the project actually entails. Ever heard of scope creep? It is the main culprit why good projects go bad. A scope creep is when your client keeps on pushing or demanding for more services, but are not really giving you a time extension and the funds to do what they asked for. 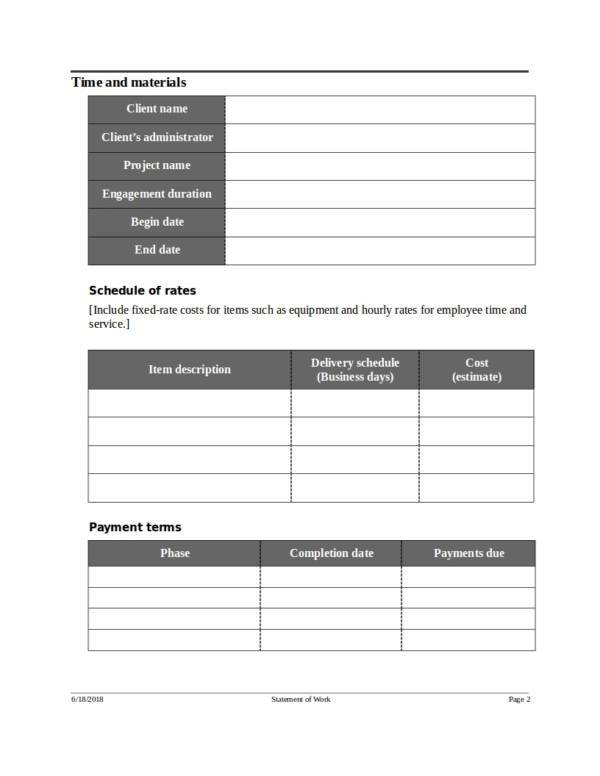 A statement of work that is signed will help you prevent this from happening by creating an updated statement of work with the new time frame and budget so that everything can be put in place. 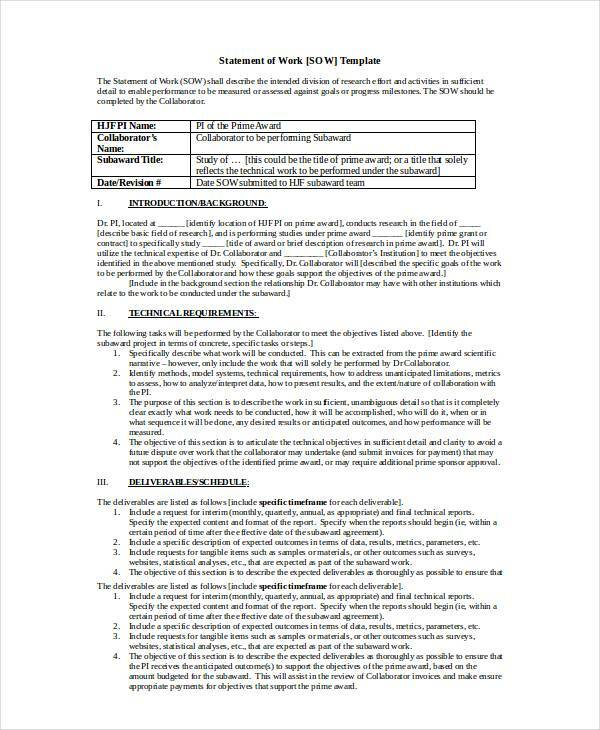 A statement of work is part of a contract, but it can also be effective made into a contract when both parties involved in it sign the document. This way you won’t have to go through any billing troubles and unpaid invoices. 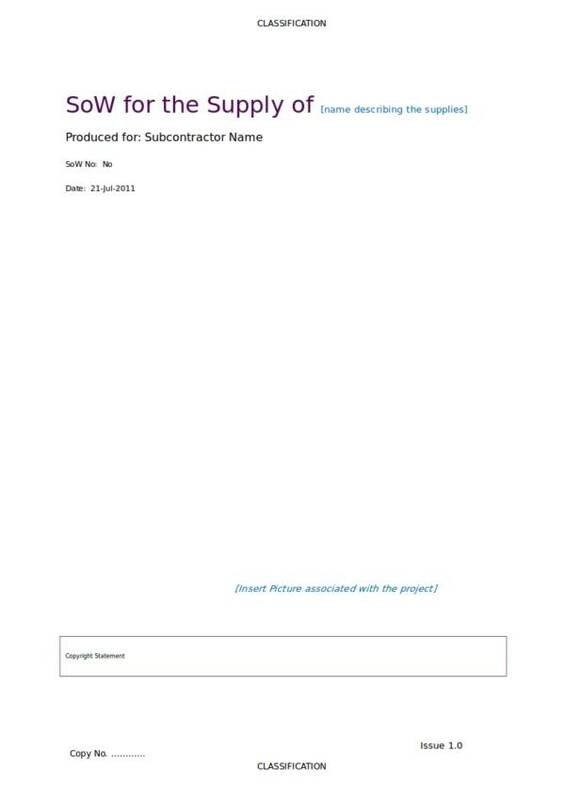 The document is used to avoid confusion in the project and ensure that everything about it is clear to everyone. A statement f work is indeed a very important document. Would you believe that it is even the first thing required before planning a project? There are other forms or types of statements that are as important as a statement of work. You can visit our website to learn more about them. 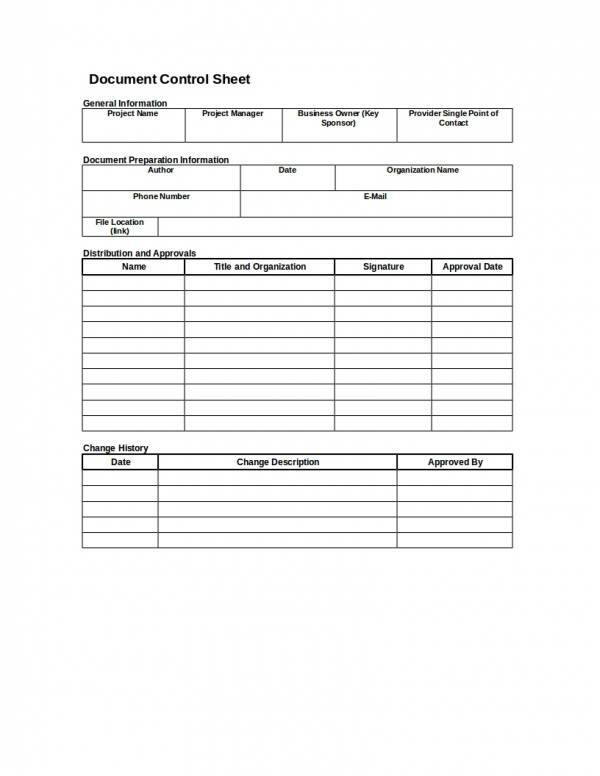 The articles we have there, include Statement of Account Samples & Templates, Statement of Claim Samples & Templates. and Scope Statement Templates. What Makes Up a Statement of Work? The parts of a project is where we are able to get the needed details and information about it. Similarly, to further understand what a statement of work is and how it is considered as a very important project document, it is essential that we learn about what makes up the entire thing. 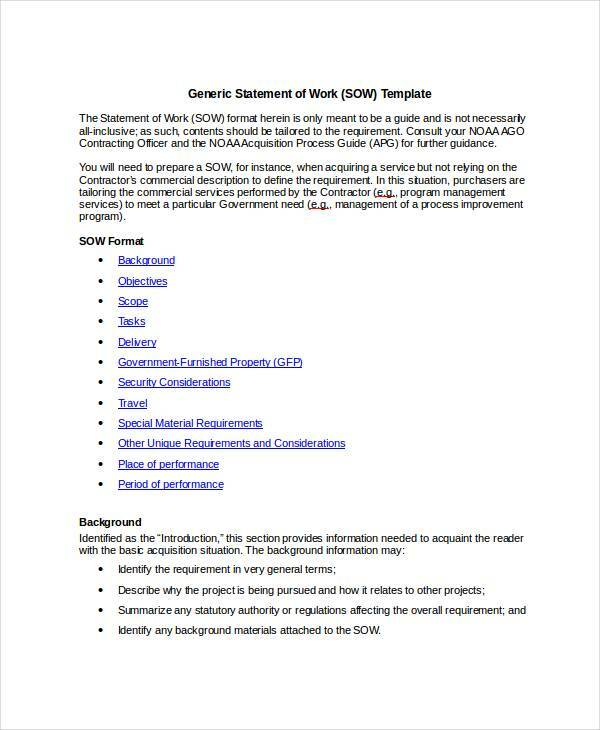 Below is a list of the things that makes up a statement of work. The introduction that explains the entirety of the work to be done in the project. The specific purpose of the project as to why it is done, its objectives and goals and other questions related to the reason why the project. 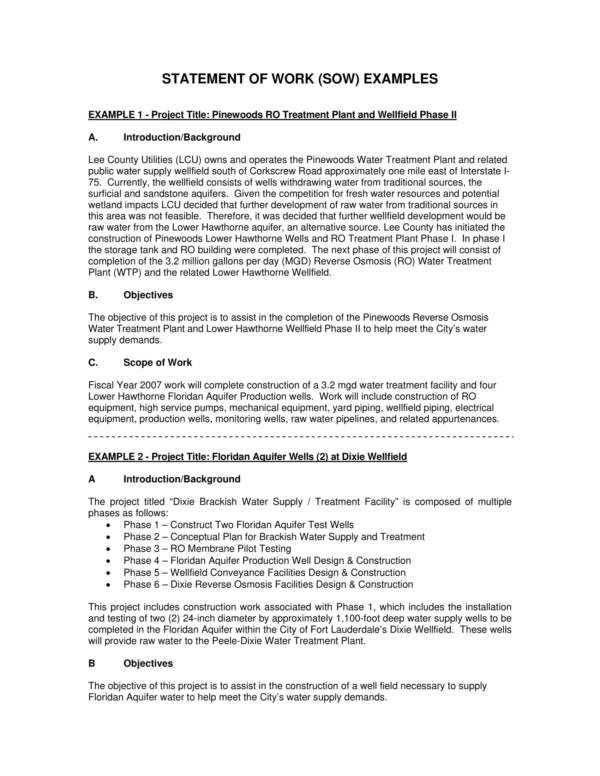 In this part, every question about the purpose of the project is answered separately. The scope of the work to be done in the project, which involves the things, tools or equipment needed for the project, the expected outcome of the project, the the general steps that should be done in the process, the time frame, etc. The location or place where work will be done should be specified because the project could simply be done someplace, which could either be near or far. 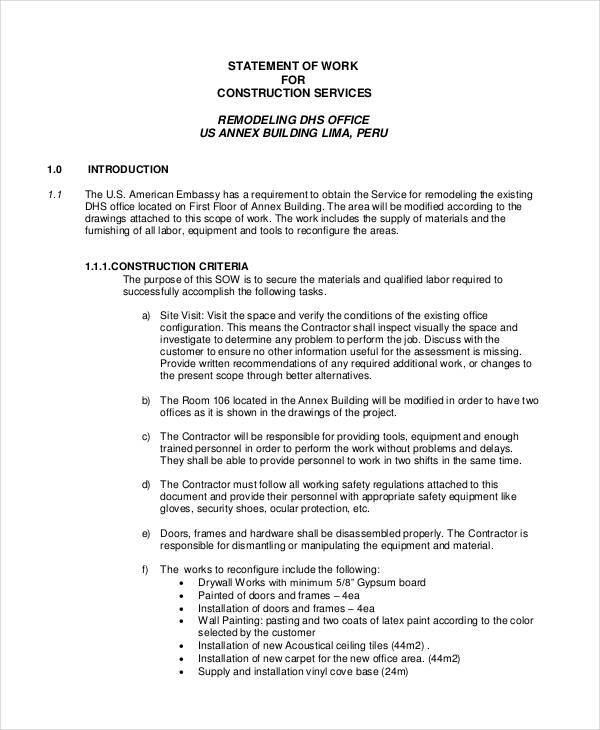 This part points out the specific work location, like if the project can be done from home, if it is site specific, if there is a central headquarters where it should be conducted and so on. The required tasks are the specific actions needed for the project. The scope of work provides the steps on what to do they are broken down into more detailed and specific tasks, often with instructions on how the tasks should be done. The necessary milestones involves the dates and times when the project is scheduled to be done as well as important time frames that shows its progress. The list of deliverable that are required for the project as well as their specific details, like size, dimension, color, quantity, etc. The required standards related to the project if there are any and the product testing. This prvodes a list of what are involved and who are involved in the process. The set schedules refer to the when the equipment or deliverable should be done, which includes the kick off, the performance period, the review stage and implementation stage, etc. 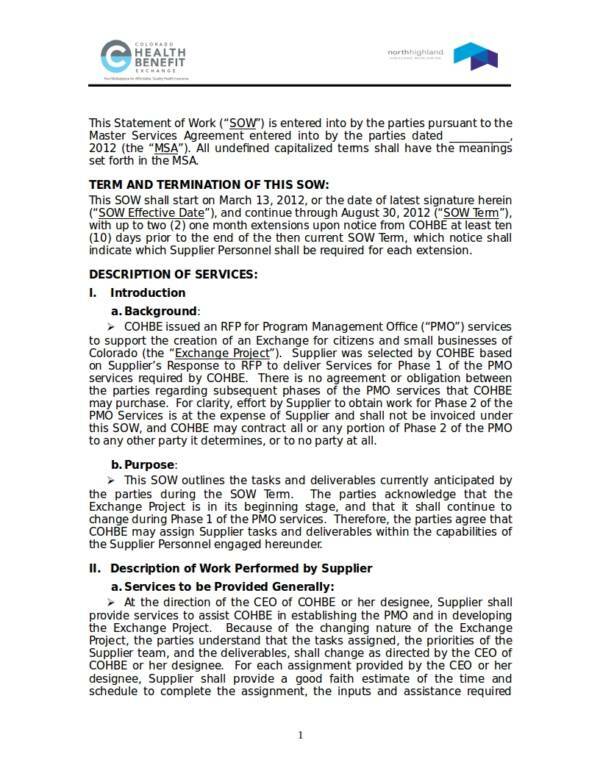 Closures refer to the delivery of the deliverables, who will receive it and sign it off, etc. As you can see, a lot of things make up a statement of work and missing single part may be crucial to the entire project and a mistake that should be avoided at all cost. Although the parts of a statement of work differ from most the parts of those other statements in existence, the easiest way to get familiar with these parts are with the use of various samples and templates. Some of the topics that you may find interesting are landlord statement templates, compliance statement samples and templates, and narrative statement samples and templates.